Since I arrived here in Frankfurt, Germany I only went to two hairstylists. The first one was in Eschborn were I had a normal wash, haircut, blow dry and styling that cost me 89€+ tip. Okay, in fairness, I liked the cut. It was very much 60’s just as I wanted it to be. But it was way too expensive for me. I admit I am a sucker for discounts and whenever I cannot get a good bargain, I try not to go back to the same place anymore–if I can avoid it. 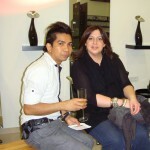 So, the next haircut I had, I went to a Pinoy who was then learning to become a registered hairstylist here in Germany. I liked his style, probably because he knows the Filipino way of pampering the hair and the client. Since then I was hooked. I always asked him to take care of my hair… my shining glory, so to say. I noticed that my hair felt good in this Pinoy hairstylist’s careful, good hands. Back then it was not very difficult to make an appointment with Jezz. One call, as long as it is outside his school hours and practicum time, I managed to get my hair pampering done. 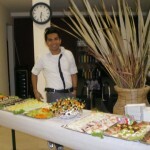 And since Jezz is really good at his profession, I started to recommend him to other Filipina colleagues at work, too. By the way, those who live outside the Philippines, you do know the drill right? The arrangement is that 3 or more ladies would come for the hair treatment. Haircutting schedule is always arranged at somebody’s place where bonding, eating and storytelling (chismiss) are already included. As the years passed and Jezz finally finished his degree, it slowly became difficult to get appointments from him. 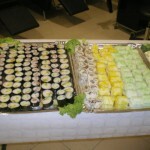 He was always on the go, to a wedding, a birthday party or a gala event where he is booked. And of course, he also was employed at a hair salon here in Frankfurt am Main, where some of his customers include TV moderators and models. On top of that, he was also doing his Masteral studies, hence, his schedule was really tight. So, what we did, after every session with him, we would already book the next appointment in six weeks time. Yes, that’s how long we would have to wait. For some, who can’t make it to the said appointment will have to wait for the next one after that. I for one, always had to wait longer because I would always miss the appointments for some spur of the moment reason. Lame, I know..but it always happened. Anyway, after Jezz finished his Masteral studies, he planned to open his own salon here in Frankfurt am Main. When he was asked when this would happen, he always humbly replied that it would still take some years for his dream to come true. He needed to save up first in order to start on his own. But as luck would have it, the salon where he was working had to close down. So, he took the chance to finally start anew, this time as his own boss. Right in the heart of Frankfurt am Main, Jezz found a place where he could open his own salon. His clients from his previous work still comes to him. Of course, his Filipino “suki” are more than happy since now, it is definitely easier to make an appointment with him. 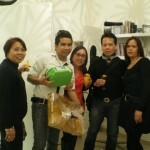 Last night, Jezz officially openned his salon. The guest was a mixture of German and Filipino beauties. Jezz hairstyling is finally open for business. The Philippine Consul General, Her Excellency Maria Cleofe Natividad graced us wih her presence. 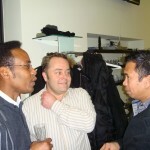 Among others were Jezz’ close friends, ex-colleagues and those valuable long-time clients. So, to Jezz, I salute you. I wish you much success in this new venture of yours. I’m so proud of you sister!!! Jezz has a cosy two seater salon located at Eschersheimer Landstrasse, 25 in Frankfurt am Main. For appointments, he can be reached at 01741843863. Or visit him at Facebook: Jezz Hairstyling.